It’s that time of year when I find myself with too many tomatoes and very little time. If you grow your own tomatoes or buy them from your local farmer’s market, chances are you also find yourself with more tomatoes than you can shake a stick at. Either way…you suddenly have WAY too many tomatoes on your hands! And you certainly don’t want all that deliciousness to go to waste. 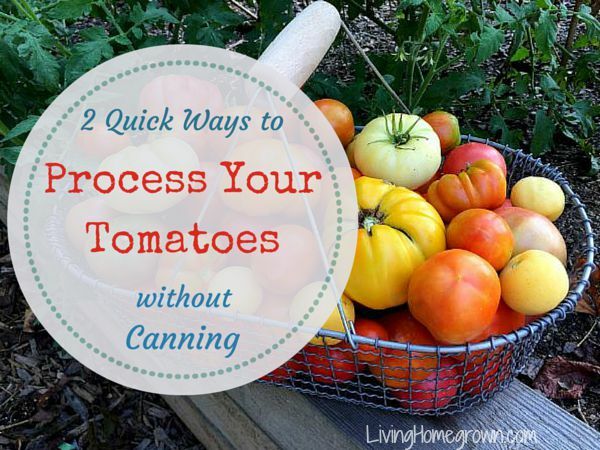 And yes, you could can up all those tomatoes with a few tasty canning recipes. But sometimes…you may want to do something that is FAST and EASY. When I don’t feel like making canned tomatoes, I turn to some of my other preservation methods to save those tomato flavors for later. Below, I have listed how I process those tomatoes as either juice or stewed tomatoes WITHOUT canning them. Both involve ultimately freezing the tomatoes. During these late summer months, I keep space in my freezer specifically for this purpose. It just keeps me sane and I hope it helps you too! I use my steam juicer to juice everything from grapes to plums to…well, tomatoes! And I love it! A steam juicer is easy to use and very efficient. You add the produce to the top and let the steam do all the work. You don’t even have to peel the produce. All you have to do is keep your eye on it while it steams. Easy! After juicing, I pour the tomato juice into clean canning jars (leaving a 1 inch head space for expansion) and freeze it. Later, you can defrost that tomato juice for amazing soup (seriously, it makes the BEST soup), stew or any recipe calling for tomato juice. I like to freeze mine in pint-sized jars so that I can use it in small amounts. But you can freeze it in any size jar. No need to break out the canner when you do it THIS way! However, there is a downside. The steaming process does some water to the finished juice. In other words, the juice is not as concentrated as it would be if you actually squeezed the tomatoes. The finished juice still works for soup and stew – it’s just not as strongly flavored as the original tomato. If you need more concentrated flavor, there is an easy fix. When you defrost the frozen juice, simply cook it down a bit before using. When you cook it, you boil off most of the water and you are left with more concentrated flavor. The add the reduced tomato juice to your soups, stews, etc. 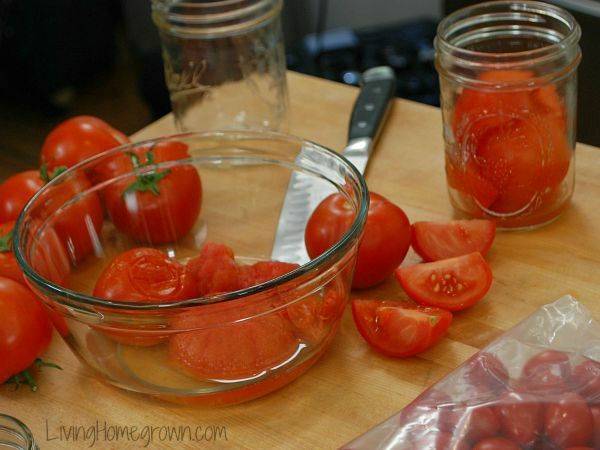 This is a very fast and easy way to preserve tomatoes as “stewed tomatoes”. Why do I say “stewed”? Because when tomatoes freeze and then defrost, they are broken down and softened – just like a stewed tomato. But they still have ALL of their fresh picked flavor. And when you freeze them in this way, you do NOT have to peel them! That’s right. You can just pull the peels out later when you defrost. That makes this another efficient and time-saving processing technique. To learn more, check out How to Freeze Tomatoes (the easy way). Do you have any tricks for saving tomatoes for later (besides canning them)? Tell me in the comments. I’d love to hear! When I have extra tomatoes, I like to dehydrate them. Just slice them into rounds and put them in the dehydrator overnight and their done! Then I slip them into freezer bags and freeze them. They last a long time in the freezer and are great for soups, stews, etc. They save a lot of freezer room that way too! I’m with you! In fact, earlier this week, I submitted a post with the “I’m OK with Freezing” sentiment. Although I do want to make sure there are some canned tomatoes in our pantry, I also end up freezing a good bit. We’ve fallen in love with roasting our tomatoes. During these hot months, if I’m tempted to turn the oven on, I make sure that we’re filling it up! I usually end up roasting weekly. This week actually, I had a rack full of tomatoes/peppers/onion, a rack full of butternut squash and then squeezed in our supper – Tilapia and roasted asparagus. It’s a huge time saver! The details are in the website link. I slow roast them with garlic and olive oil and then freeze (if I don’t eat them all straight from the pan). It heats up the kitchen (2 hours of oven time), but so worth it. Last summer I gave up on canning and froze quite a few tomatoes. I chopped them fairly small, spread them out on a plastic cutting board and froze them. I did the same with the unbelievably abundant anaheim peppers (unbelievable because I live in the PNW and peppers rarely mature in large numbers). I put the frozen tomatoes and frozen peppers in zip bags and we had nearly fresh pico de gallo in winter. Yum! extra tomatoes and also tomato juice. Making spaghetti sauce is very time consuming when doing it but is oh so nice to have throughout the year when you need a quick meal. I make it with green peppers and onion from my garden plus celery. Interestingly, I recently saw a TV show where a chef was making fried pies with re-hydrated apples. I’ve been drying tomatoes for years but never thought about making a pie from the dried fruit. They are good as snacks whenever you need a boost. I attempted to use a pressure canner today. I couldn’t ever get the weight to jiggle like the manual said it should. Bottom line, I’m worried that it didn’t process correctly even after a couple of hours trying. Should I water bath the tomatoes to make sure they are safe? I boil my tomatoes to make them easy to squeeze. then I squeeze out my juice with my juicer that you turn with your hand. Last I re- boil my juice, have your jars washed and ready, boil your caps and place on the jar with hot juice. It seals. No canner used. Everyone I know, friends and family does this and it works.